What does garlic have to do with the much-touted Mediterranean Diet? A LOT! Garlic may very well be the secret-not-so secret, super-ingredient that makes the Mediterranean way of eating, the powerful life saver and preserver that it is. As many already know, the Mediterranean Diet is associated with a reduced risk of cardiovascular disease, cancer, as well as a reduced incidence of Parkinson’s and Alzheimer’s. These diseases ravage populations that follow the “Western” way of eating in contrast to the Mediterranean way. It is the use of fresh vegetables, fruits, nuts, whole grains, yogurt, and olive oil, moderate consumption of animal protein, a regular consumption of fish and other seafood, as well as herbs and spices, especially, GARLIC (and onions) in the Mediterranean diet that offer the enormous health benefits. Also, it is the diet’s exclusion of excessive saturated fats, fast foods, processed and junk foods that makes the Mediterranean diet singular in health-wiseness!! In contrast, the Western diet is notorious for its high-carb, sugar-salt-laden, high cholesterol and fatty foods, as well as excessive protein, especially red meat. The pantries of Americn homes and supermarket shelves display a dependence on processed, refined and packaged foods. These have become staples of the Western diet prevalent in the developed and developing nations of the world. So, what makes the Mediterranean diet the undisputed champion whem compared to the Western diet? To repeat: It’s the fresh fruits and vegetables such as avocadoes, tomatoes, oranges, lemons, grapes, berries, and many others, with their multitude of anti-oxidants, phytochemicals, vitamins and minerals; it’s the whole grains and unrefined cereals, including whole wheat, brown rice, oatmeal, barley; it’s less animal protein, and more fish and seafood; it’s the Omega-3 fatty acid of olive oil and of nuts and seeds, such as natural almonds, sesame seeds, walnuts, pistachios, sunflower seeds, and peanuts; and, it is yogurt, the herbs and spices, GARLIC, in particular, that in combination, provide an incalculable store of health-boosting factors that nourish the body and fend off disease. What’s Garlic Got to do with it? Garlic may very well be one of THE most important ingredients within the Mediterranean diet that helps give the diet its fame for reducing the risk of tumors, cancer, and cardiovascular disease, lowering blood pressure, thinning the blood to prevent the formation of blood clots, preventing atherosclerosis and other chronic diseases. With over 300 powerful chemical substances resulting from crushing raw garlic or after cooking it, this miraculous herbal bulb provides tremendous health benefits to us. Both the National Cancer Institute and the American Cancer Society have endorsed scientific evidence pointing to garlic’s anti-tumor properties. In a number of studies garlic was found to inhibit the development of various types of cancer, including breast and skin cancer. Studies in Italy, China and the United States have also determined that including garlic in one’s diet can be protective against cancer. In numerous clinical research trials, garlic proved its effectiveness in preventing and treating cardiovascular diseases. Strokes and heart attacks, the number one killers in the Unites States and other nations in the world, are caused by blood clots in narrowed veins and arteries, the result of LDL (the bad) cholesterol deposits in blood vessels, high blood pressure, and atherosclerosis. Garlic is effective in thinning the blood to reduce clotting. 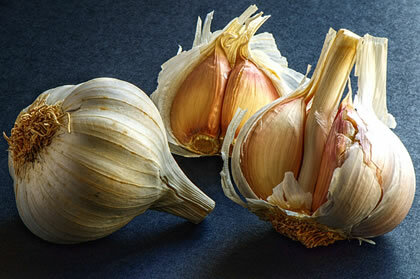 Garlic lowers LDL cholesterol, reduces blood pressure, and prevents the clogging of the arteries and veins. In addition to fighting cancer and cardiovascular diseases, researchers have also shown that garlic’s action is anti-bacterial, anti-fungal, anti-virus; effective against tough bugs like Staphylococcus and Streptococcus, as well as e-boli; it boosts the immune system, also fights HIV and AIDS. Garlic is a powerhouse of health-giving substances that can be counted on. It certainly plays an ALL-important part in making the Mediterranean diet the healthiest way to eat. The Mediterranean Diet is THE way to go! The Mediterranean way of eating simply works! It bestows upon the disciples of this way of life, a healthier body and mind, cleaner veins and arteries, a stronger immune system, in short, a longer, less disease-prone life. If Apollo still reigned in Greece, maybe they would call the Mediterranean diet, the “diet of the gods!” People who adhere to this diet reign supreme over their counterparts who eat the Western diet, the regular fare of bacon, pancakes, syrup, french fries, cheeseburgers, (heard of the Luther Burger? ), sodas, deep fried-you name it, overly-sweet, gooey desserts with extra whipped cream, chips this, chips that, cookies, crackers and “cereals” of every color, shape, and name (O’hoy, Crackle, Sprackle, Crinkle and Flackle). Dump Crackle, Sprackle, Crinkle, Flackle: Eat Real Food, the Mediterranean Way (with Garlic)! Gently, oh, so gently (and not to startle outright the sensitive obstinacy of our cherished gustatory fetishes and spoiled taste buds) we must wake up (at least, one day), to realize, that THAT STUFF IS NOT REAL FOOD! It is just THAT: crackle, sprackle, crinkle, flackle, the “make believe food.” For our make-believe world?! It IS all becoming unreal. Quite unreal. And, of course, in a crazy Unreal World what should we expect but crazy Unreal Food! Just dump it – and eat REAL FOOD, the Mediterranean way! And stay healthy! Eat garlic!